About seven years ago I bought A Treasury of Science from Vinnies for about $2. 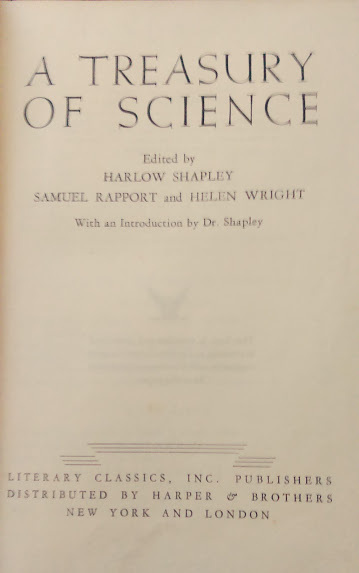 It is an old beaten anthology from 1943 of influential scientific texts from Newton, Franklin, Einstein, Huxley, Jenner etc. The final section of the book looks at Man’s Future. I have never read the book, but last week I had a flick through it and thought Kirley F. Mather’s essay The Future of Man as an Inhabitant of the Earth (1940) looked interesting. The optimism (or hubris) of the essay jars with the current mood and scientific evidence. All the evidence combines to lead us unmistakably to the conclusion that for many scores, if not hundreds of millions of years to come, the earth will continue to be comfortably habitable abode for creatures like ourselves. Surface temperatures of the earth, the most important item in any consideration of its long-range habitability, are determined by the receipt of solar energy distributed through atmospheric agencies…Minor changes in climate will doubtless occur as they have in the last few thousand years. Leaving aside the Australian Government and others who think everything will be fine for “hundreds of millions of years”, today there is a fear that over the next 50 years habitability of the earth will dramatically change. Of course, this doesn’t justify simplistic dissmissals of science – “they got it wrong then so they can get it wrong now”. But that in the space of 75 years the paradigms and frameworks through which we understand ourselves and our relation to the environment dramatically shift. Such that we could uncharitably accuse Mather naivety, as people 75 years hence may, with greater justification, accuse us of being slow to react.